A relic of the colonial era, Ayers House transports visitors to bygone days of Adelaide’s history. The former home of Sir Henry Ayers, five times Premier of South Australia, it is grand mansion with three levels of antiques and art. The 19th century colonial style architecture and interiors with painted high ceilings, chandeliers, handcrafted furniture, silver and several pieces of art is a top tourist attraction in Adelaide. Explore the house from top to bottom starting at the State Dining Room and make your way down to the cellars and the underground Summer Sitting Room or head up to the Bedroom Wing on the first level. There are also two exhibits dedicated to the life of Sir Henry Ayers and displays his personal effects. Paid Parking is available on-site. Some areas may be closed to public in case of private events or functions taking place at the house. Child 13 - 16 Yrs $5.00 AUD. Child 12 and Under Free. Public Holiday Timings: 1 pm to 4 pm. How popular is Ayers House Museum? People normally club together National Wine Centre Of Australia and Rundle Mall while planning their visit to Ayers House Museum. Ayers House Museum is a great spot right in the centre of Adelaide. 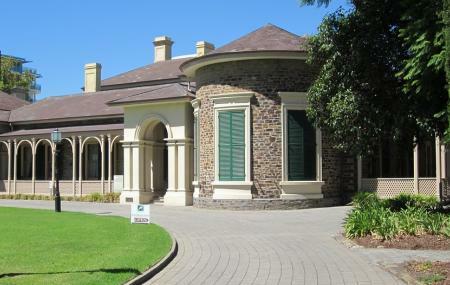 As they say, it is the finest Victorian-era house in South Australia. There are three levels of awesomeness to explore, across the bedrooms, dining rooms and offices. My favourite room is Henry Ayer's office on the lower level. There's a giant and awesome desk, beautiful architecture, and being below ground is always a few degrees cooler than upstairs. Beautiful. It’s not his stuff but the house is very nice. Makes you think what it was like back then. Must have been rich. Ian was lovely. Thank you for my private tour Ian. A relic if the Victorian era, but unlike the UK National Trust, thus us much more hands on. You can sit in the chairs and get much more from the experience. A charming house. A lovely bit of old Adelaide. Check out the amazing painted ceilings. Wonderful to visit and hear about the history of a Victorian era house. Rosemary was our Guide and she was so knowledgeable and patience with us. Highly recommend a visit to see the house and meet the volunteers who work there.